Phuket pineapples are unique for their sweetness, aroma, colour and texture; they’re certainly very different from other nationwide and worldwide varieties, so much so that several international airlines insist on serving only Phuket pineapples. As these pineapples can only be found in Phuket, the government launched a project to improve and enhance the quality and to promote them as a unique Phuket crop. 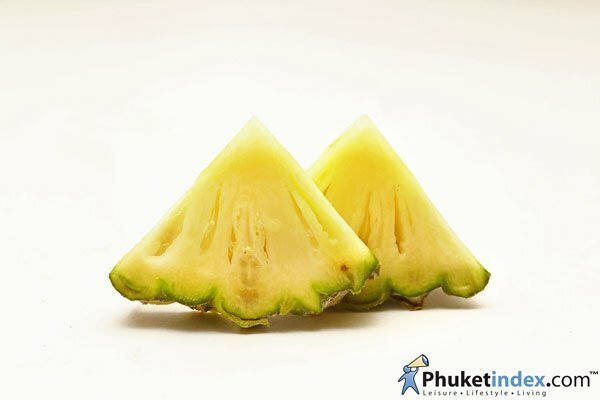 On November 27, 2552 (2009) Phuket’s pineapples were offi cially announced as a separate entity by the Department of Intellectual Property. Now the island’s pineapple plantation owners are working together to use the same tactics in pineapple planting in order to preserve the pineapple’s character and to increase its value. Not only will this benefit the farmers but it also helps consumers obtain premium quality goods. To buy Phuket pineapples you can easily fi nd them downtown Phuket at the large market on Ranong Road or at roadside fruit stands. Along Thepkasattri Road (the thoroughfare leading to Phuket International Airport) is another good place to buy them. But the best place to fi nd this luscious fruit at super cheap prices is just over the Sarasin Bridge in Phang Nga Province where you’ll fi nd dozens of stands selling not only pineapples but freshly caught crabs!